With his ambitious Century Trilogy, historical fiction master Ken Follett has made himself the most prominent author to novelize the full sweep of the 20th century. He started with Fall of Giants, a tale of the first two decades that stood out because of its cast of strong-willed, socially diverse and pop-from-the-page characters. 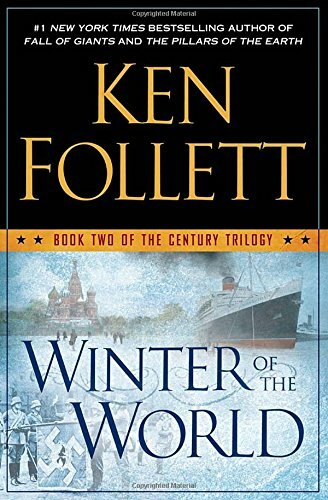 In Winter of the World, a more breathtaking and far ranging tome, the author forces the second generation to come of age in the battle-heat of World War II. Mr. Follett planned this series well. With cinematic deftness, the author has placed each of his characters just where they need to be—and the effect is electrifying. A British visitor to Germany witnesses Hitler orchestrate the burning of the Reichstag. Later, an American heiress is compelled by circumstance to drive an ambulance during the London Blitz. Harkening back to his spy thriller days, Mr. Follett lovingly portrays the cloak-and-dagger-life as a Russian spy recruits disillusioned Germans to hand over battle plans. As the first Japanese bombs fall on Pearl Harbor, Mr. Follett’s characters are bobbing in a small boat in the bay. On D-Day, one of his soldiers seizes a Norman bridge after dropping by parachute behind enemy lines. Even the concentration camps are sagely foreshadowed by having a German character discover Aktion T4, the secret Nazi program to exterminate the handicapped and mentally ill.
And yet for all its sweep, this story—like all rip-roaring tales—begins small, in 1933, when the Nazi Brown shirts destroy the offices of a liberal newspaper on the grounds that the editor had criticized the Chancellor. The German Von Ulrich family and their friends have fought fascism from the start and they pay a high price for their ideals. Mr. Follett entertains no shades of gray about fascism even in the early years. In this world there exists no sympathetic adult who might have succumbed to the promises of fascism (order, jobs, food)—like so many Europeans of the 1930s—before coming to the stunning realization of its true nature. Winter of the World is at its thematic best when dramatizing these clashes of ideas. They are debated in forums as public as Parliament and as private as pillowtalk among Russian lovers with the radio turned up loud to thwart any spies. Breathless prose attempts to liven up committee meetings, but these reimagining of conferences and summits too often come across as snooze-worthy as, well, political committee meetings. The private discussions have more visceral impact, like when the Russian spy and his wife marvel at a smuggled Sears catalog, wondering why anyone who could have all these wonderful things would choose to be Communist. Foreshadowing the cultural clashes of the decades to come, there’s also a thrumming ribbon of very liberal late 20th century attitudes that pop up throughout. Homosexuality, interracial relationships, and women’s equal rights in the home are quickly accepted by the good characters and uniformly despised by the villains—Nazis, for example. There’s also the tired cliché of a brutal naval officer who also happens to be a repressed homosexual. A good part of the charm of the first book was that it had a distinctive cast , including a one-eyed female correspondent, a few coal-mining doughboys, and a Russian immigrant-turned-American-gangster. In this second book, the two women who aren’t relegated solely to the role of wives—Daisy and Carla—emerge to display guts and gumption. But the men of Winter of the World don’t fare as well. There’s Woody and Werner and Chuck and Lloyd and Greg and, thankfully, one Volodya. These young men are about the same age and are all deeply involved in their respective English, American, German, and Russian political systems. They tend to wash into one another. It may be inevitable that in a book of such amazing ambition that spreading the story so wide means spreading the characters too thin. But what Winter of the World lacks in emotional depth it makes up in nonstop, lightning fast, world rocking events that’ll keep history buffs plowing through every one of the 1,000 action-packed pages. Lisa Verge Higgins is the RITA-nominated author of 13 historical and contemporary novels. Her most recent book, The Proper Care and Maintenance of Friendship, was released in January 2011.